There are five standard frequencies used around the world for mobile broadband services (3G/UMTS): 850, 900, 1700, 1900, and 2100 MHz. Different phones and data cards support different subsets of these frequencies, and you always need to make sure that the device you use supports the frequency used by the mobile operator. Here's a list of the frequencies used in different countries. 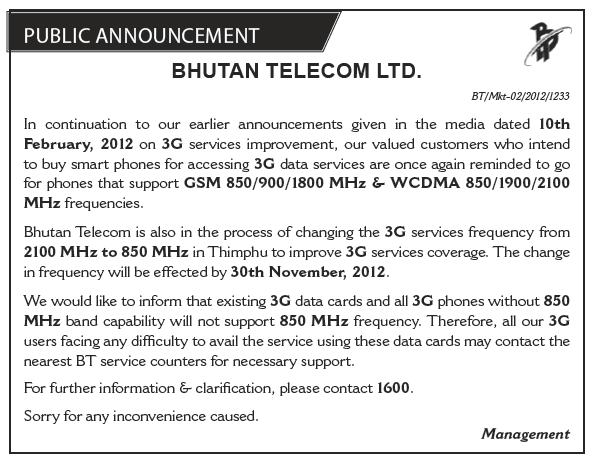 On November 30, Bhutan Telecom is changing the frequency of the 3G data services from 2100 MHz (used by most countries) to 850 MHz, in order to "improve 3G services coverage". To guarantee a smooth transition, make sure your data card or smartphone supports 850 MHz.